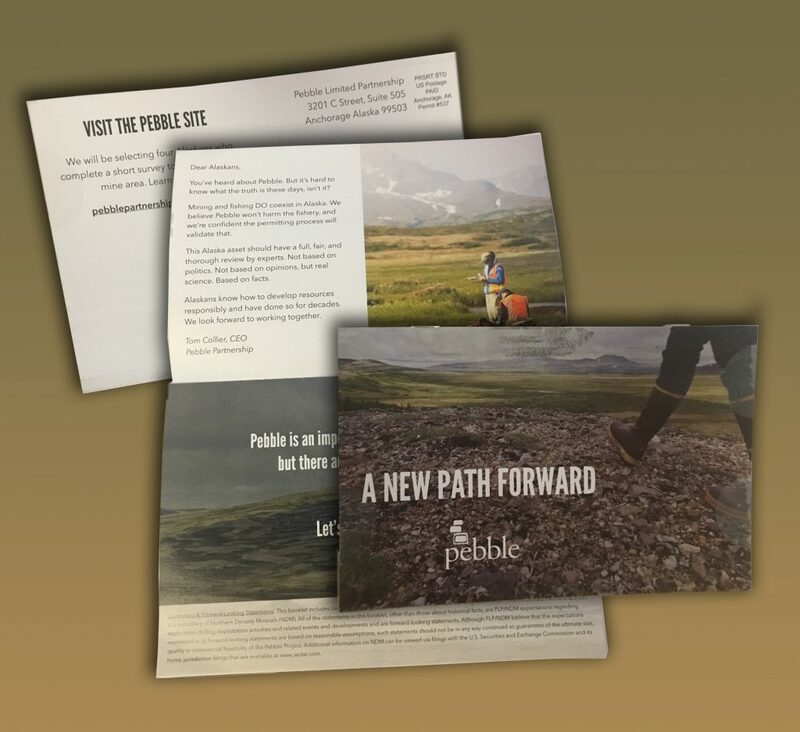 Pebble Limited Partnership (PLP) has been working on its public relations efforts, to include a revamped website, fact sheets, direct mail, and podcasts. These are aimed at fostering a “new path forward,” with the goal of changing its image in Alaska, where many residents don’t favor development of the mine proposed in Bristol Bay. A poll conducted by Hays Research Group in June 2018 found that “75% of survey participants reported that they somewhat or strongly oppose developing the Pebble Mine.” (Polling was conducted on behalf of United Tribes of Bristol Bay, a Pebble opponent.) Changing perceptions of the project is one of the company’s main goals, after finding a new partner. Alaskan households received this 20-page pamphlet in the mail last week. The press releases and materials from NDM and PLP seek to address the fears of three key audiences: Alaska residents, potential partners, and Northern Dynasty Minerals shareholders, who have been waiting for good news since May, when First Quantum Minerals opted not to finalize an agreement to join the project. Speaking effectively to all of these groups is a balancing act. The 20-year plan submitted for permitting seeks to develop a small portion of the estimated resource, which NDM anticipates to be easier to permit. The company continues to tout the entire deposit as an investment opportunity, even though it may never be developed. That’s because the West deposit (the focus of the current permit application) is much more accessible than the East deposit, which lies under some 1,000 feet of overburden that would need to be removed. The East deposit is estimated to extend at least 5,000 feet below the surface. Significant challenges exist for getting to this resource, whether surface mining or underground mining techniques are used. PLP’s investment in public relations efforts does not extend to detailed descriptions of the actual mine plan currently in permitting. 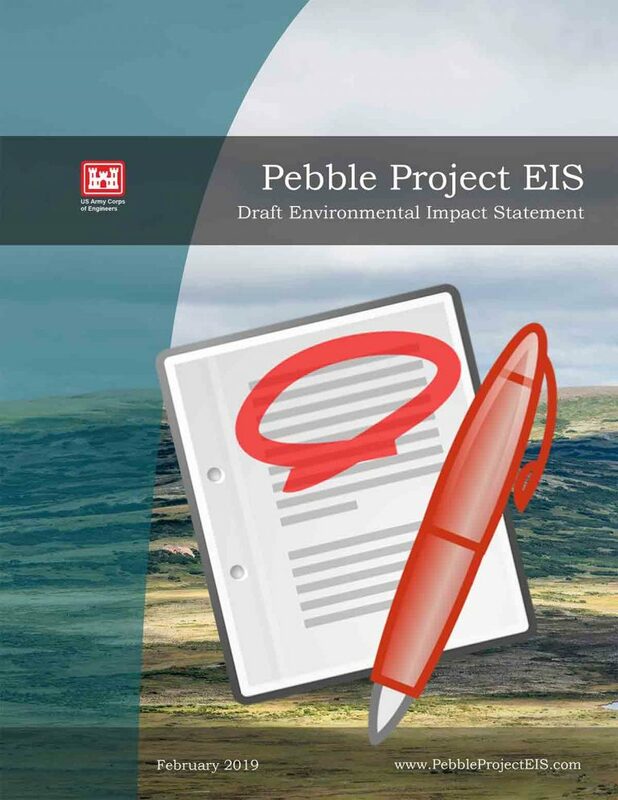 To have a thorough understanding of the project, readers need to visit www.pebblepermiteis.com to find the original permit application documents, updates and PLP’s answers to 133 data gap questions posed by the U.S. Army Corps of Engineers, the lead agency for the Pebble project’s permitting process. Additionally, readers can access 962 documents (comprising more than 107,000 pages) that the Corps’ 3rd-party contractor, AECOM, is referencing while developing a Draft Environmental Impact Statement (DEIS). The Corps plans to release the DEIS by the end of January 2019. At that time, the public will have one more chance to officially weigh in on the proposed development, during a 90-day comment period.